Recipe for Buttermilk-Walnut Coffee Cake with Orange Essence. 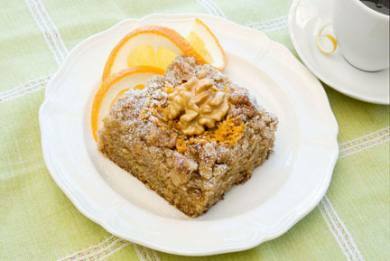 The flavors of orange and walnuts pair beautifully in this exquisite coffee cake. Preheat oven to 350ºF. Grease a 13 x 9 inch baking pan or coat with nonstick cooking spray. Combine the flour, 1 teaspoon of the cinnamon, the salt and ginger and sift together into a large bowl. Add the brown sugar and granulated sugar and stir until the sugars are mixed evenly with the flour. Add the orange zest and oil and stir until the mixture is damp and crumbly. Remove 3/4 cup of the crumbly mixture to a small bowl and add the walnuts and the remaining 1 teaspoon cinnamon. Set aside, to use for topping later. Add the baking powder and baking soda to the mixture in the large bowl, then stir and toss to combine. Beat together buttermilk and egg, add to the flour mixture, and stir just until the batter is blended; don’t over mix, some small lumps are okay. Pour into the prepared baking pan and sprinkle evenly with the reserved topping mixture. Bake 40-45 minutes, or until the center of the cake springs back when pressed lightly, or a toothpick inserted in the middle comes out clean. Makes one 13 x 9 inch coffee cake: 20 pieces Nutrition information per serving: Calories: 370, Fat: 28 g, Saturated Fat: 6g, Protein: 12g, Carbohydrate: 19g, Cholesterol: 20mg, Sodium: 270 mg, Fiber: 2g.